Reference number for this case: Oct-54-Cannes. Thank you for including this reference number in any correspondence with me regarding this case. Testimonys accumulate, coming each day to bring some new details either about the saucers, or about the flying cigars. Whereas Saturday evening, several people worthy of faith, including Mr. Bérenger, mayor of Saint-Laurent-du-Var, general adviser, had seen above Nice, a disc of orange color, this time above Cannes, several people observed a luminous machine of yellow color with a green tail. But the most interesting witness was to be brought by an employee of the municipal receipt of Antibes, Mr. Casella, Bio resident, who, returning home in the evening, found himself face to face with an enormous mechanical machine measuring 7 to 8 meters in diameter posed in the middle of the road. The witness who was on a bicycle approached the machine until almost touching it but the latter then rose vertically and disappeared in the sky with a slight whistling sound. In the sky of Provence, in Venergues, several vintagers saw a machine of lengthened form like a cigar, stated one of them and of white and blue color a second one specified. A third vintager indicated that the rocket appeared to emit luminous rays. In Le Puy, a brilliant object was observed between 05:30 p.m. and 18:35 p.m. by the weather station of Puy-Chadrac. The machine looked like a straight olive with at the top, a kind of black antenna. The chief of the station specified that he believes to be in the presence of planet Jupiter, but the sudden disappearance of the object showed that he was wrong. The same phenomenon was seen by the center of meteorology of Ruyères (the Cantal). One can connect these testimonies to that of thousands of Tulle residents who around 03:30 p.m. saw in the sky, in the south-eastern southern direction, a large shining and motionless spot. It seemed transparent and had the shape of a cylinder whose two ends were conical. Mr. Maurice Ruant, farmer with Sinceny, close to Chauny (the Aisne) was almost the victim of the panic which the appearance of the flying saucers or other flying objects causes to some people. He was busy repairing his car, in a meadow near his home, when two gun shots were fired to his direction. The bullets crushed on the body of the vehicle, not far from his head. Mr. Maurice Ruant pressed charges and the investigation at once open made it possible to quickly find the author of the two shots, who was a neighbor to Mr. Ruant, Mr. Faisan. "I believed, by seeing a silhouette moving in the light of two headlights, to be in the presence of a Martian repairing his flying saucer. I went to get my rifle and I shot". In spite of his good faith, Mr. Faisan will be prosecuted. Not looked for yet. Probably the 06:15 p.m. meteor of October 14, 1954. 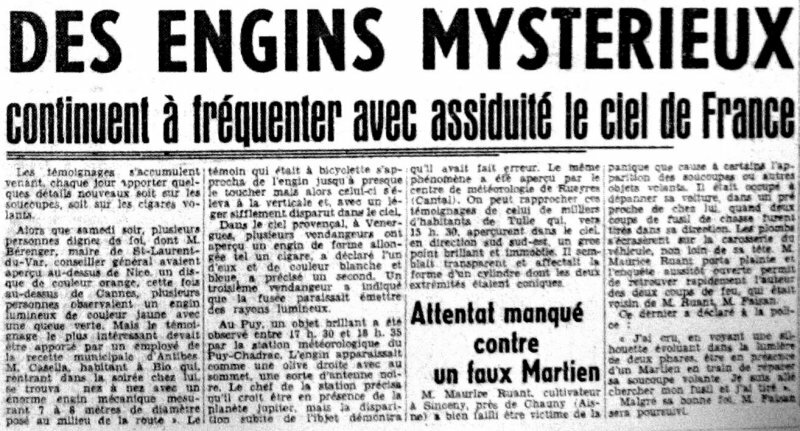 [le1] Article in the regional newspaper L'Est Républicain, France, October 18, 1954. 1.0 Patrick Gross June 6, 2010 First published.